Hand painted gourd, folk art style farm scene. Nice, thick gourd with a 1-1/2" opening and a leather strap for hanging. Bottom has drainage holes. Acrylic paint is sealed for outdoor use. 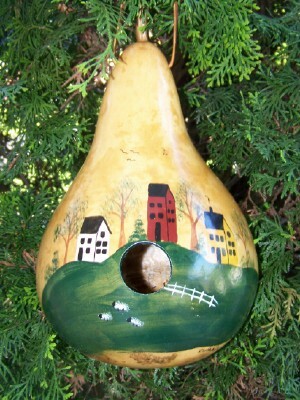 Large gourd, Size: 8"- 9" W X 12" H. Would make a great gift for a bird lover.